I've been looking to this look back for quite some time. This is by far, one of the most memorable moments in Axtone's history that I can recall. Nothing but pure nostalgia, warm fuzzy feelings and ,of course, love for one of mr. Hedfors his finest moments under Axwell. "Axwell currently sits in the studio in Stockholm and work on the final details for his own debut album. The first single is called “Center of the Universe” and instead of calling his superstars to friends – Axwell chose to contact Magnus Carlson, the lead singer of Weeping Willows as a vocalist. " #AXFACT: That's right. 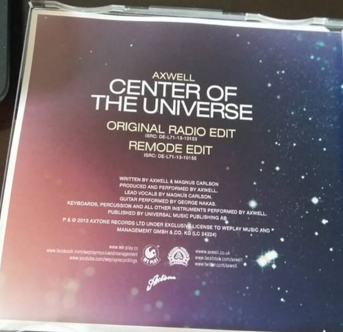 Center Of Universe was supposed to lead the Axwell album. 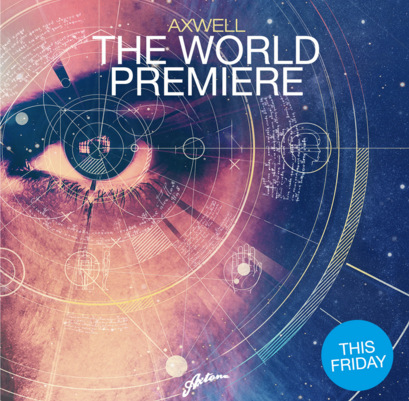 Suddenly, it was announced: The preview of an Axwell Remode. I will forever remember the vibe of the warm and summery european night of May 10th. Tong announced the remode...and yes, Axwell delivered. O, how Ax delivered!! Suddeny Jaguar vibes just filling the scene out of nowhere...this Remode did what every remode did before: shock and conquer. After the dust had settled, the following things happened: The original got released on Ultra along with some...not so ultra fine remixes of which the contents I have buried deep deep below in my consciousness after listening to them. However...the Remode, the mightiest of all versions, found it's way to it's proper home May 30th: Axtone. I must say, after typing this lookback I stand even more by the thing I opened with: This release is without a doubt one of the most memorable Axtone moments I've been lucky enough to enjoy. Center Of The Universe is Axwell and Axtone at their very finest, and looking back to these days is something I do with absolute pleasure, as I did just now. Last edited by Vinelli on 12 Mar 2016, 06:42, edited 8 times in total. There is a lot to be said about this milestone-release and I want you guys to share it all! Not necessarily pure information, but your feelings and memories are more than welcome! Below is a little addendum of extra information that I couldn't fit in the lookback above. Some really interesting facts, some of them I never knew myself untill today! So, let's start with the interview with J'adore House Music (https://jadorehousemusic.wordpress.com/ ... ka-axwell/). The blog post revealed quite some interesting stuff that is easily overlooked, given that the piece is hidden quite well nowadays. “I knew about Axwell, that he and the Swedish House Mafia is big international, but for me that music were more Ibiza and Stureplan. Meanwhile, I had a favorite track with Axwell, which I liked a long time, “Together” I’ve listened to a lot at home” says Magnus Carlsson. During the day, Nöjesbladet was in the studio when they recorded Magnus lyrics and the song were named “Center of the Universe“. -“It’s about that feeling when you and your girlfriend, or best friend, has been partying all night and standing there on the beach and see the sun rise. When you know that right here and now it’s just the two of you who are in the “Center of the Universe”. There is a 2010 documentary that featured the song heavily, as it was shot during the days Magnus his vocals got recorded in a studio somewhere. Axtone made a mini doc about Axwell's love with Stockholm, in light of the COTU release. #AXFACT (inside a post filed with #AXFACTS ): Part of axwell's answer was used for something to make our ears happy: the AFP intro we have today ! I'd say this is my favorite release at least since 2012 on the label. From intro to outro, this Remode is just an incredible, genre-crossing track. It was also the perfect intro for Ax's 2013 Tomorrowland set. Lots of good AxFacts on this one! THE TRACK THAT GOT US REALLY BACK TO AXWELL!!! The 1st live preview of this new version was from his gig at Toulouse, INOX 2013.
he always wanted to have his 'jaguar' track. so he remarkable did it. Dont forget this track, Axwell started to make it in 2005.... so ALMOST 10 years to put it perfect. from time to time I still listen in full the remode version... and ofc its in my restrict top 10 tracks from Axtone/Axwell, and when that happens I think you already know what kind of the track is this... I just dont need to praise Ax again. Its a track of a life for sure. Last edited by Didas on 11 Mar 2016, 19:21, edited 2 times in total. That moment when somebody on the chat said he saw Cotu tease on tv and we couldn't believe until he recorded the commercial with his phone. That moment when Cotu remode got premiered on the radio and that piano break suddenly came in! jz1 wrote: That moment when somebody on the chat said he saw Cotu tease on tv and we couldn't believe until he recorded the commercial with his phone. That moment when changazzz wasn't the first person in the universe to hear the track. Great post Vinelli, i salute u sir ! What a VIBEEEEEE in this videos !! !